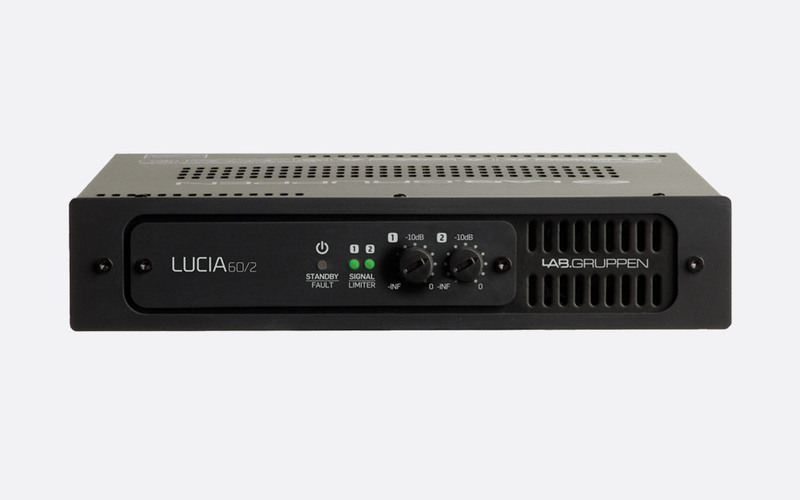 This range of two-channel amplifiers have been designed for applications in retail, education, restaurant and office environments,offering total outputs of 60, 120 or 240 Watts. 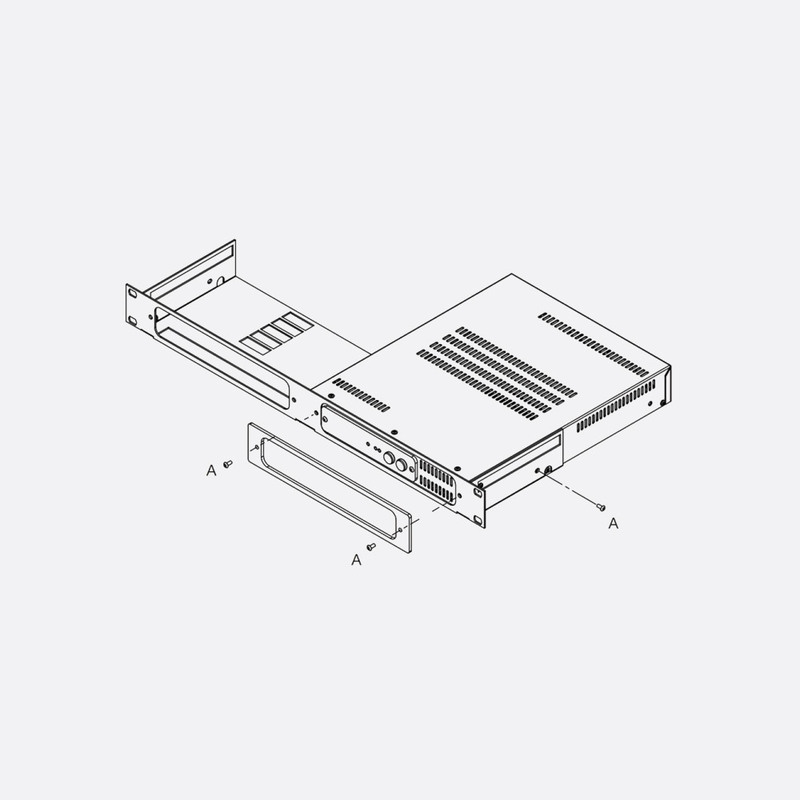 The compact half-rack, 1U amplifiers can be installed near to the audio source, such as lectern, projector or reception counter, as opposed to a remote systems room. Wall-mounting is possible with the supplied wall-mount bracket; optional pole-mounting and rack-mounting kits are also available. These LUCIA - Localised Utility Intelligent Amplification - amplifiers have differing power outputs. The standard set of three amplifiers have two dual-channel matrix inputs which are mixed down to a two channel signal, to feed the two channel output. 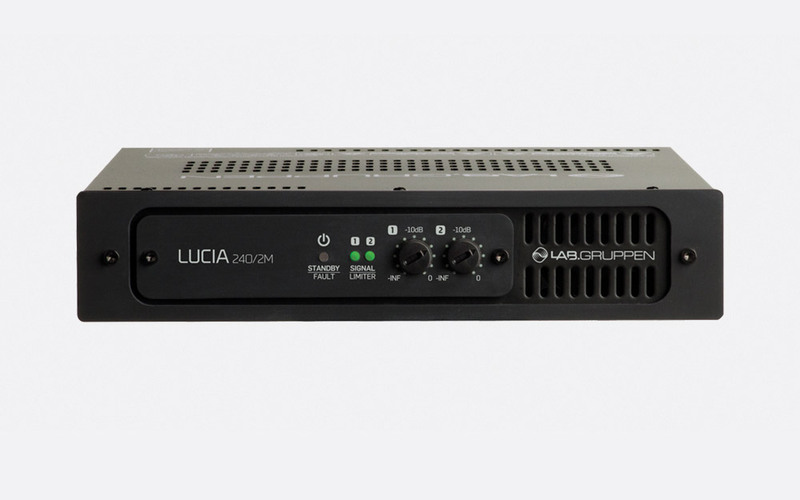 Three 'M' version amplifiers have similar power outputs, but have a more comprehensive mix matrix of four in and four out - more commonly used where there are multiple audio sources. 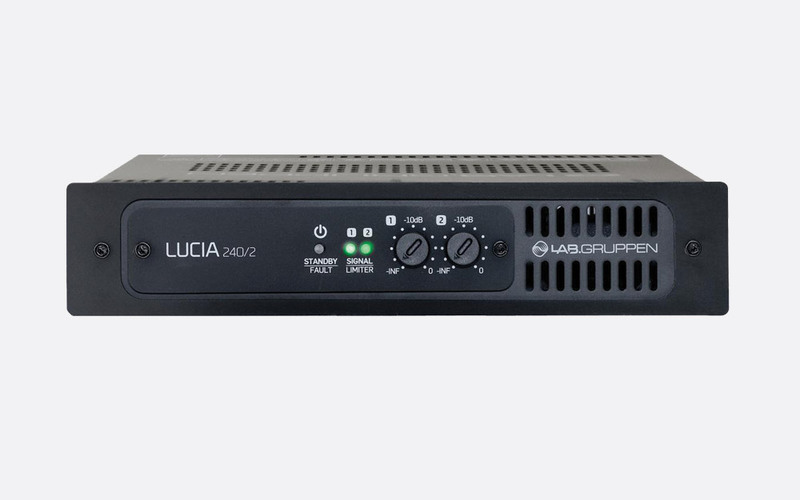 All have the same automatic standby mode as the LUCIA line-level amplifiers (see Lab Gruppen Power Amplifiers - LUCIA - 70V, 100V for further details), where the unit is set to standby mode if no audio input signal is sensed for a period of 20 minutes, thus consuming less than 1 watt. 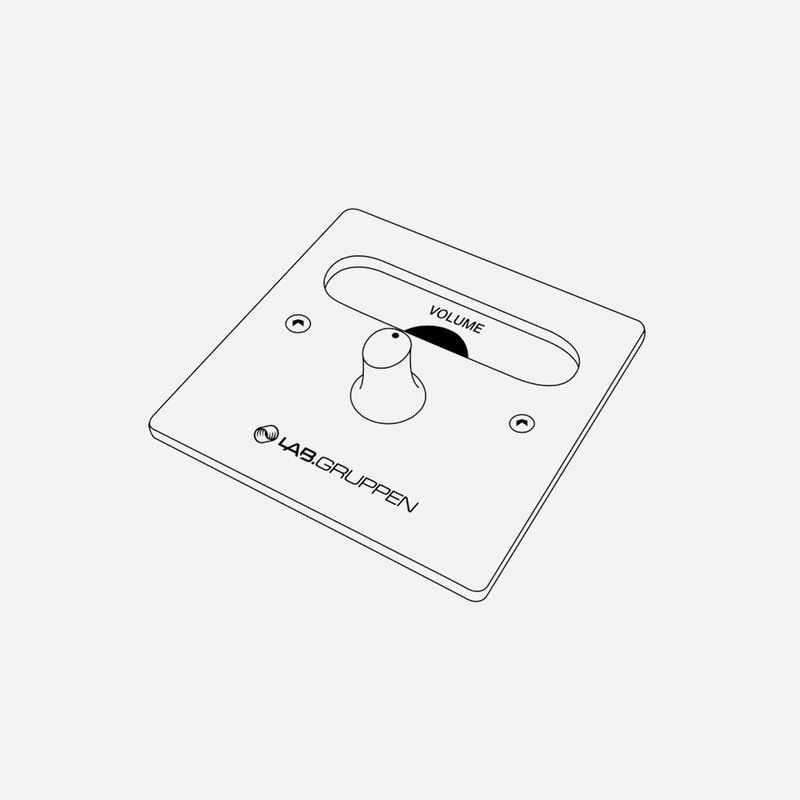 All inputs and outputs are detachable screw terminal blocks, positioned on the rear panel, other than the alternative inputs for on of the two-channel inputs on unbalanced RCA (phono) connections. The 2x2 mix matrix of the LUCIA 60/2, 120/2, and 240/2 can be adjusted and set remotely by way of a computer based software wizard. This also gives access to DSP functionality such as 'Automatic Dynamic Loudness Contouring', and pre/post matrix EQ filtering including up to four EQ sections per input and four EQ sections per output. EQ presets can be recalled to match many compatible loudspeakers. The 4x4 mix matrix of the LUCIA 60/2M, 120/2M, and 240/2M have the same DSP functionality, with the added function of routing any of the four inputs to either the two amplifier outputs, or to the line level output channels. 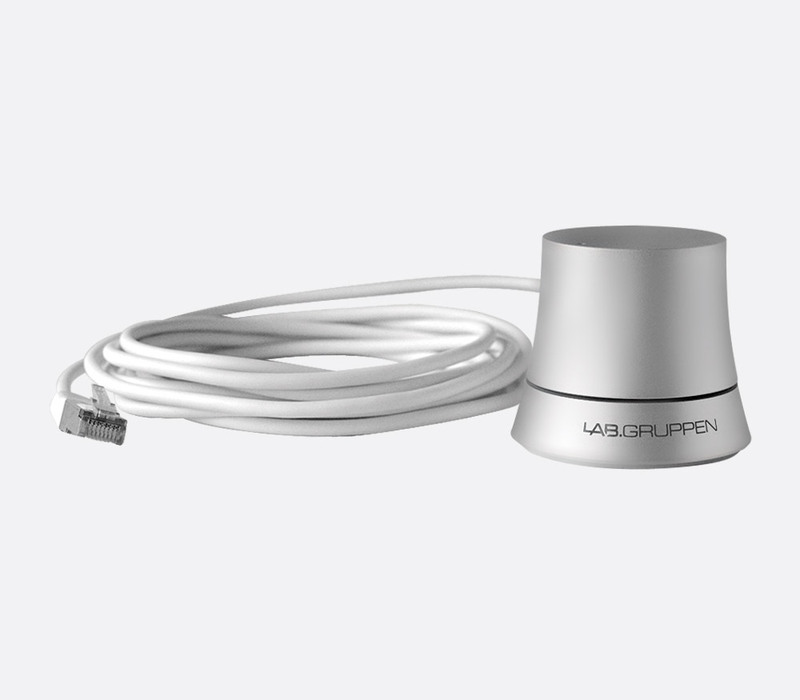 PC or Max OSX software has a 'wizard' setup function for fast adjustment; an advanced setting allows offline configuration that can later be downloaded to the amplifier at a later time. Both are transferred to one or multiple amplifiers via USB. The same USB connection can be used to update firmware. 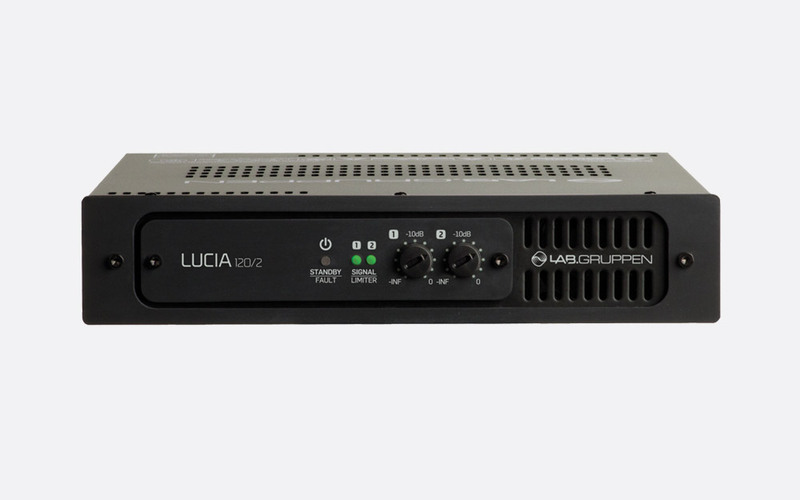 Rotary level adjustment controls are positioned on the front panel of the amplifier, with LEDs to signify the signal and limiting status. A third LED shows the standby mode or fault status. All models: Nominal voltage: 100-240V AC. Operation voltage: 85-265V AC. Standby consumption: Less than 1W. Dimensions: 216 x 44 x 280 (w x h x d) mm. Weight: 1.9kg.